As you walk around our area during winter, you may notice rustling in the underbrush and an unusual variety of bird calls. These are signs that you have come upon a mixed feeding flock. Our Nature Guide Jon Latimer takes a look at one way some birds survive in winter. "After breeding season has ended in midsummer, it is not unusual to see several different species of small songbirds feeding together. This behavior, known as mixed flock feeding or mixed foraging, can last through winter. Mixed flocks move from place to place, so you may run into one almost anywhere. Sometimes they stay around for only a few moments, other times you will find a flock in the same place for days at a time. "Different flocks seem to combine birds of a similar size. A typical mixed flock of smaller birds usually includes chickadees and titmice. Chickadees regularly call out when they find a good source of food. This attracts other species. 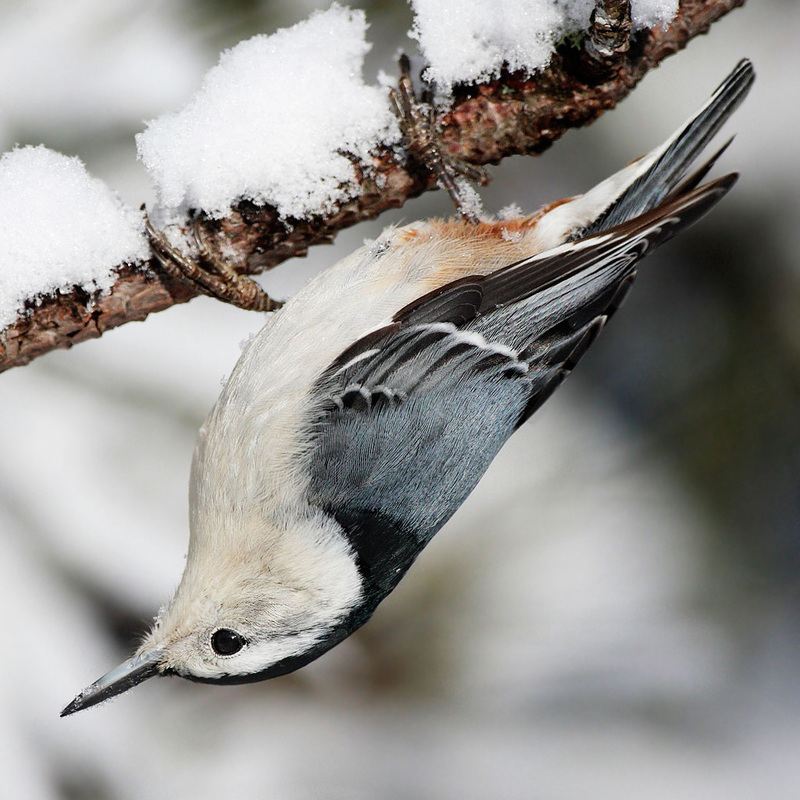 Nuthatches, warblers and small woodpeckers can often be found foraging in these flocks. 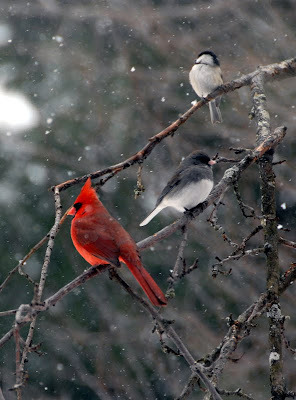 Occasionally they are joined by cardinals and juncos, and sometimes by Blue Jays. You may even see a kinglet or Brown Creeper once in a while. "Larger birds such as robins, starlings and cowbirds also form feeding flocks. These flocks tend to forage higher up in the forest canopy and are constantly in motion. "There seem to be two main advantages to joining a feeding group. First, a flock has a better chance of finding food than a single individual. Competition between birds in a mixed group tends not to be a problem because different species seek different food sources. "The second advantage is that a flock is more likely than a lone bird to detect a predator such as a hawk. For example, a chickadee's keen eyesight makes it an excellent lookout. Also, when threatened, many individuals fleeing in different directions may confuse a predator and allow all of them to escape. "As the breeding season approaches in spring, feeding groups break up and each individual goes its own way." At my feeders (we feed all year long), I have indeed experienced this - We are blessed with an abundance and variety of birds - part of my reason to begin "Birding". With the exception of the Kinglet, I have seen all mentioned in this post, including Finches... This year, we were visited by two Northern Flickers - a first for me - very colorful! Although the 'resident' Hawk has not been able to catch one of this mixed flock(to the best of my observation), he did bag a squirrel at the feeders a few weeks ago... first time I've ever witnessed that! Keep up the nature posts!!!!! Thanks for your comment, Paul. We do plan to post more nature pieces in the future. Congratulations on all the wildlife you're attracting to your feeders.